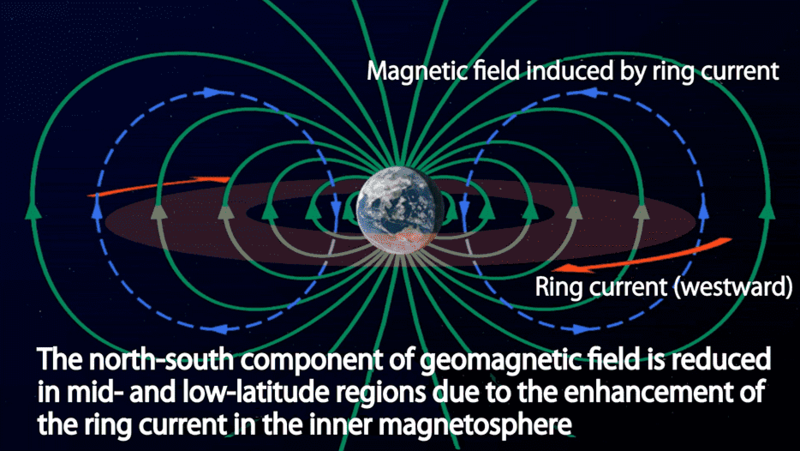 Figure 1: The earth’s magnetic field. Green lines show the magnetic field lines. 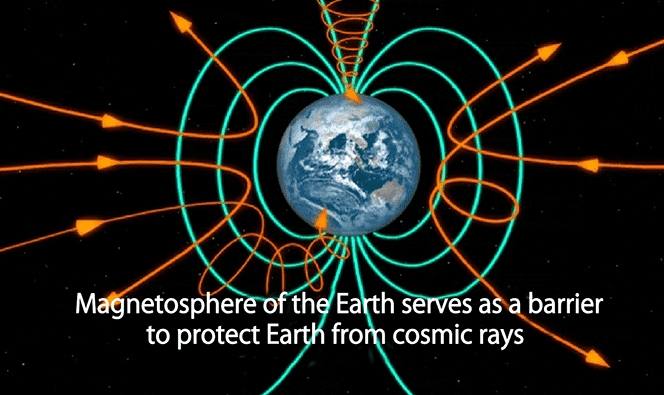 Figure 2: The magnetosphere plays a role of a barrier to protect the earth from cosmic rays. The motion of charged particles such as electrons and ions (plasmas) is changed by Earth’s magnetic field. As a result, high-energy charged particles associated with cosmic rays and proton phenomena (SEPs *1) cannot easily reach the middle- and low-latitude regions (Figure 2). In other words, Earth's magnetic field acts as a barrier to such high-energy particles in the outer space. Figure 3: The magnetosphere calculated by a magnetosphere MHD simulation. Green lines show the magnetic field lines and yellow color shows the plasma pressure distribution around and inside the magnetosphere. Solar wind brows from the left side and the earth’s magnetic field lines are stretched toward the opposite direction. Earth's magnetic field does not extend infinitely but is deformed by solar wind (the supersonic wind consisting of plasma and a magnetic field arriving from the sun), forming a cometlike structure. We call this structure Earth's magnetosphere (Figure 3). The condition of the magnetosphere is markedly changed by the solar wind. 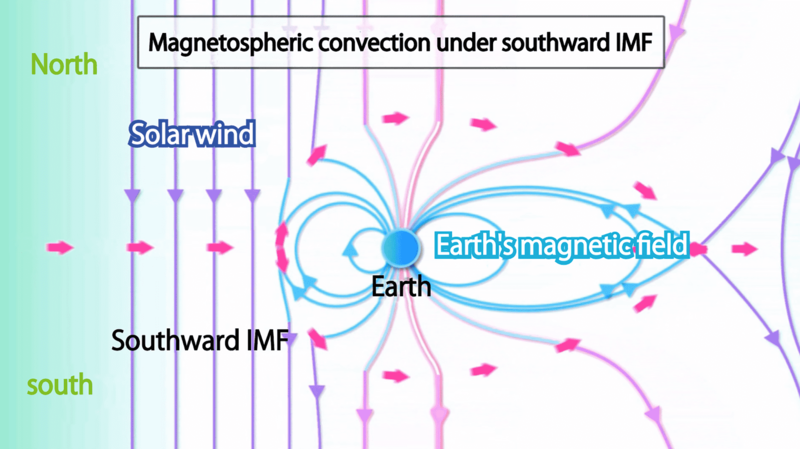 Figure 4: Overview of the magnetospheric convection driven by the southward IMF. Open field lines are carried toward the nightside by the solar wind, while their one ends remain grounded to Earth. In the distant magnetotail, open field lines from the northern and southern hemispheres gradually approach each other, resulting a situation that antiparallel field lines approach each other similarly to those in the dayside. Magnetic reconnection occurs again there. As a result, a pair of open field lines originating from the northern and southern hemispheres merge again and become a closed field line with both ends grounded to Earth. The newly created closed field line returns toward Earth and eventually toward the dayside owing to the magnetic tension force, which acts so as to recover from the stretched configuration to the original dipole field. In this way, the dayside magnetic field carried toward the nightside is replaced. 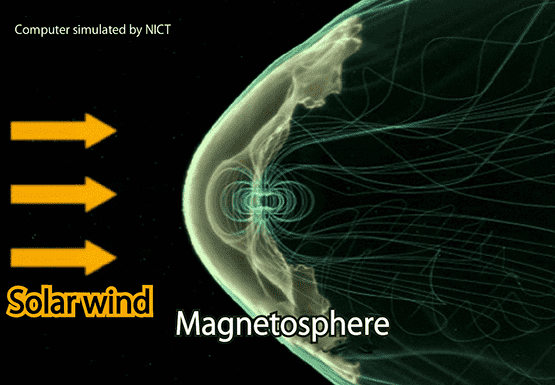 Plasmas inside the magnetosphere move together with the magnetic field. This circulation of plasmas and the magnetic field is called ‘magnetospheric convection’ (Figure 4). In this way, the solar wind energy effectively flows into the magnetosphere and drives the large-scale convection. This does not imply that no solar wind energy flows into the magnetosphere during the northward IMF. It is considered that the solar wind energy can flow into the magnetosphere owing to the viscosity between the solar wind plasmas and the magnetospheric plasmas regardless of the IMF direction. However, it is generally considered that the energy input by the magnetic reconnection is much larger than that by the viscous interaction. Figure 5: Magnetic field variation at low and middle latitudes derived from ring current. 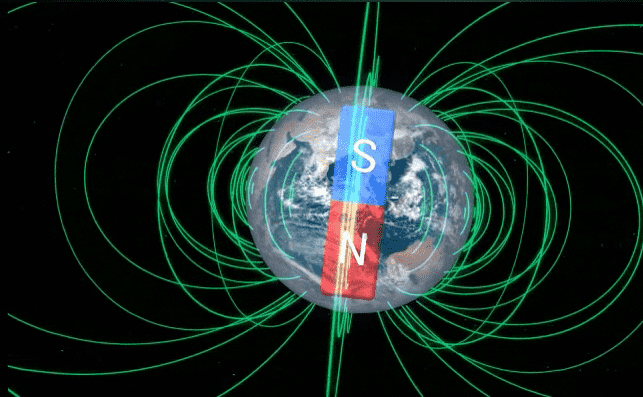 The green lines indicate the terrestrial intrinsic magnetic field, the red lines indicate the ring current, and the blue broken lines indicate the magnetic field derived from the ring current. The phenomenon causing greatest disturbance in the magnetosphere is called a ‘geomagnetic storm’. It occurs when a vast amount of solar wind energy is injected into the magnetosphere by a strong southward IMF*1 and high-speed solar wind. It is accompanied by various phenomena such as the promotion of magnetospheric convection, multiple occurrences of large aurora storms, increased plasma injection into the inner magnetosphere, acceleration/thermalization of plasma particles in the inner magnetosphere, which enhance the ring current, and disappearance/restoration of the radiation belt. Geomagnetic storms are categorized into two types depending on the solar wind structure that generates it. One is generated by CME*2. The other is generated by high-speed solar wind originating from the coronal hole. A strong shock wave is mostly formed in front of the magnetic cloud of a CME because the high-speed flow of the CME sweeps the low-speed solar wind. When it collides with the magnetosphere, it compresses the magnetosphere rapidly. The scale of the geomagnetic storm depends on the strength of the IMF and whether or not the IMF direction is southward in a magnetic cloud. Because the magnetic polarity of the IMF rotates from northward to southward through a magnetic cloud, a geomagnetic storm occurs in many cases when the CME collides with the magnetosphere. However, when the CME or solar wind does not increase in speed and the southward IMF is relatively weak, no geomagnetic storm occurs. Additionally, geomagnetic storms with or without the compression of the magnetosphere are called ‘sudden commencement types’ and ‘gradual commencement types’, respectively. The development of a ring current is indicated by a decrease in the north-south geomagnetic field component at low and middle latitudes, as shown in Figure 5. Figure 6: Image of radiation belt (inner and outer belts) around Earth. 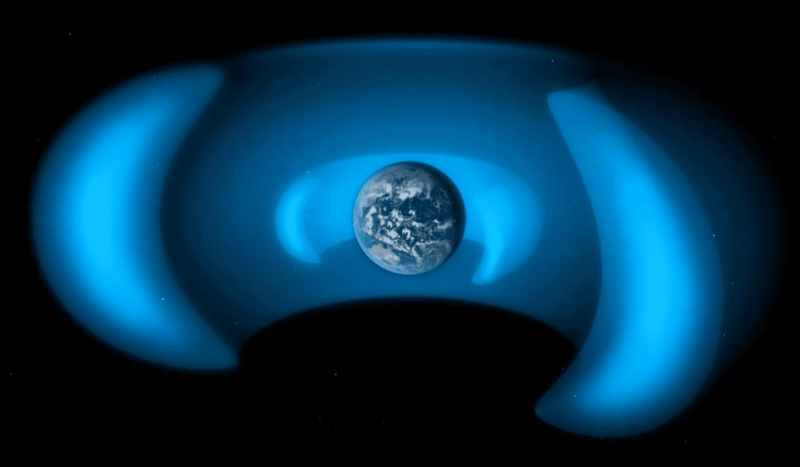 The region where high-energy electrons and ions are trapped in the magnetosphere is called the ‘radiation belt’ (Van Allen belt). The radiation belt consists of an inner belt that is distributed around an altitude of 3,000 km and an outer belt that is distributed around an altitude of 20,000 km in the equatorial plane, as shown in Figure 6. High-energy ions are mainly distributed in the inner radiation belt and high-energy electrons are distributed in the outer radiation belt. The outer radiation belt expands to a geostationary orbit where many artificial satellites are in operation. The radiation belt is not stable and changes depending on the space environment conditions. In particular, the flux of high-energy particles in the outer belt changes in the range of a few orders of magnitude depending on the solar wind condition, and the high-energy particles sometimes damage artificial satellites.